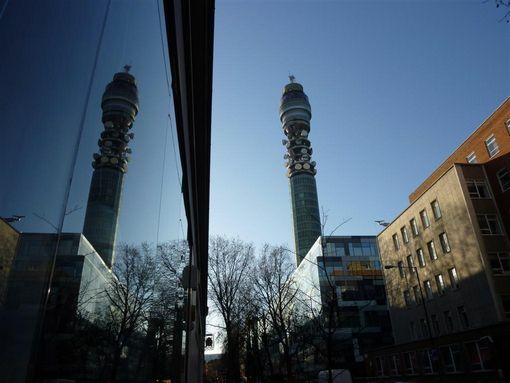 2 - via a Charity stunt; such as getting sponsored to run up the 800 stairs to the top. Either way, it is worth it. The meeting area at the top still rotates, taking 22 minutes for a full circuit. Sitting down having a very good lunch while the world literally turns at your feet in one of the tallest buildings in the UK is a unique sensation. The green roof of the Great Court of the British Museum is right of centre. 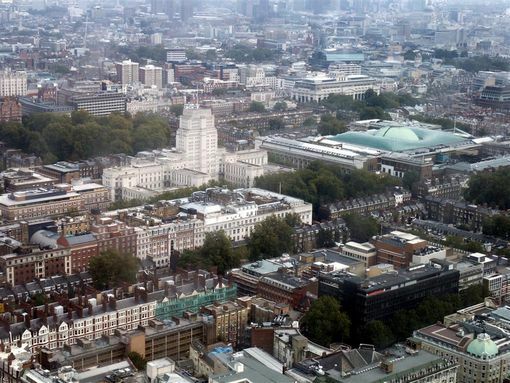 Left of centre is the white brutalist structure of London University's Senate House. 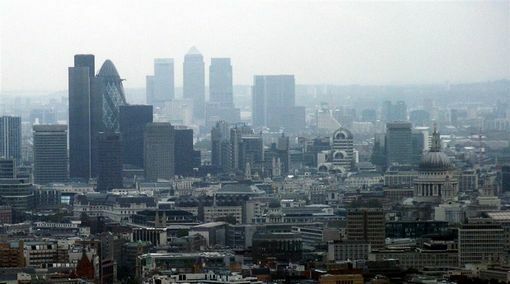 This is the financial centre of London with the tower blocks of Canary Wharf in the far background. Left of centre is the 30 St Mary Axe office block (a.k.a. the "Gerkin" for obvious reasons). The dome of St Paul's just holds its own on the right. 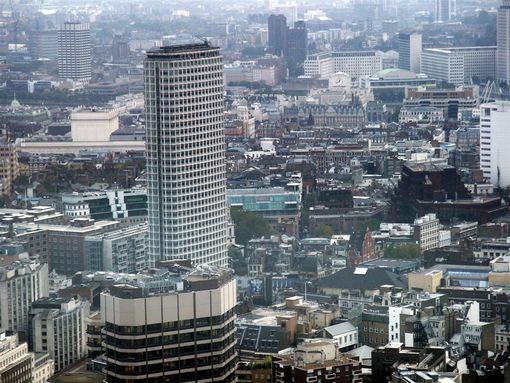 Centre Point at the end of Oxford Street is the dominant building in this photo. The Royal Opera House, Covent Garden is to the left of Centre Point, with the raised white part of the building required for raising the scenery. 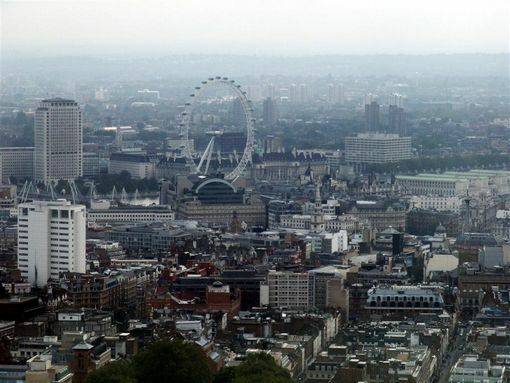 To the upper right, across the Thames is the Royal Festival Hall with the enormous Shell Centre office block behind it. The London Eye is the largest Ferris wheel in Europe. I think most Londoners & visitors have gone round it by now. 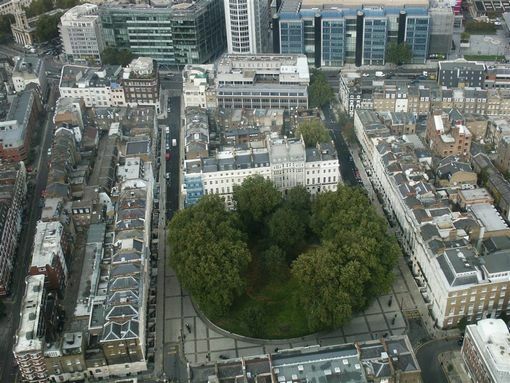 If you want more of "London from above" from a different point, then I have some of my own views from the London Eye. 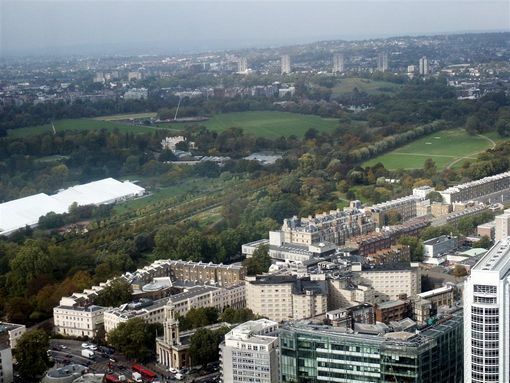 Regents Park, with London Zoo at its Northern end. London may be heavily urbanised, but at least we still manage to keep our trees wherever we can.